I thank you for your patronage and for making this a year full of good conversation and discussion. I hope the coming year can be even better, more thoughtful and more productive. May Hashem bless each and every one of you with געזונט, פרנסה און נחת, and may we all be inscribed in the Book of Life and have a very good year in all aspects. I would've liked to post a more holy picture, not just the fun part, but this is what I could do at this time. 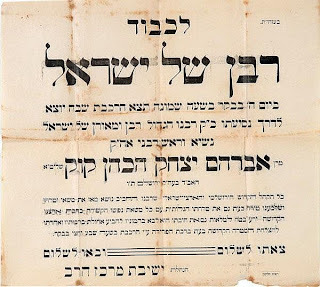 It seems that those who say the 1st Selichos on Motzoei Shabbos don't have it right. They're missing out on the way it should be done, it's just not the same. Reb Yid goes to shul at Mincha, eats or doesn't eat a big 3rd meal, hears שאלישידעס תורה or a מאמר חסידות, sings Niggunim and so on. When he gets home there's not much he can do to prepare for Selichos, since he has to wrap up the Shabbos and attend to the mundane chores of Motzoei Shabbos. The מלוה מלכה is a hurried one, and if he's really religious he Chaps a Mikveh before Selichos since G-d knows what he did since the morning Mikveh. 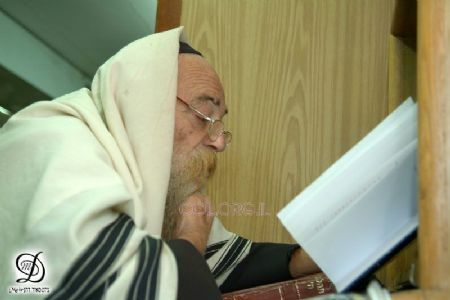 At 1am he says Selichos, usually without as much as a word of preparation from the Rov or Rebbe, watches the clock all Selichos, and is in bed by 2:15 or so, barely mumbling Krias Shema, and as tired as can be. The next morning he can barely get up, misses זמן תפלה, and the 1st Day of Selichos's davenen has יענער פנים. 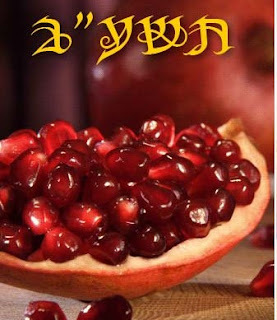 See if you can figure out to which group or קרייז Reb Yid #1 belongs to, and where Reb Yid #2 belongs. I apologize to my father in advance if he may take offense to this post. It's all in good fun. At the major asifa of Rabbonim called by Reb Matisyahu Solomon and the Skulener Rebbe, this week in Newark, NJ. One Rabbi is seeing filming the speech of RMS on his Android device... Another Rabbi took the picture of him with another non-kosher device.... וואס וויל מען פון אונז קעלבלעך אז די קוהען פאלגען נישט די אייגענע הלכות???? No, this is not the Lubavitcher Rebbe saying a מאמר חסידות, but it sure sounds like that's what he's trying to imitate!! Who says being frum and wearing a white shirt can't be fun?! I've sort of become immune to displays such as these. A few years ago I'd be upset at such videos, no matter whom it came from. Chabad especially. But now, after years of being exposed to this on Chabad and other "KIRUV" sites, I'm not upset anymore. I guess that's what you call being "desensitized." I'm not in the "kiruv" or "shlichus" business, so I don't know what it's like out there. People that ARE in the biz say that you need to be 'hip" and "cutting edge" to get people, especially young people, involved with Yiddishkeit, otherwise you can talk to the wall. It's also very easy to sit in Monsey or Brooklyn and criticize those that "do," so I guess I should hold my tongue. Maybe I'll join some kind of dance class and learn to make my "thing" like they do. I sure could stand to lose the weight, and maybe my kids will think me "cool." 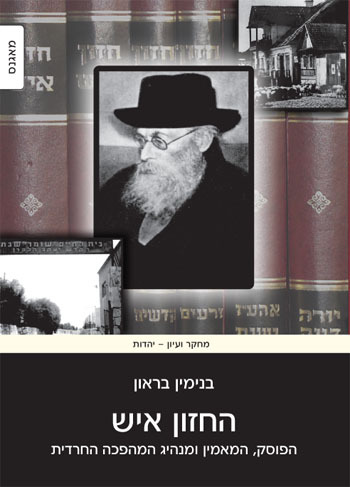 בראון does a good job stating lots of facts, some known and some not, without losing the respect that is necessary. In what has become very popular, he puts a human touch to the CI, telling us how he suffered in life both physically as well as from an unhappy marriage, but always suffered in silence and never lost his respect for her. That's one things that comes to mind. If you've read פאר הדור or מעשה אי"ש you may know alot of what's written here, but that's no chiddush. Braun is not focusing on the biography, as much as he's focusing on the ideology, as well as what made him great and what was behind many of his ideas and opinions. But even if you're interested in the biography, Braun manages to "fill in" much of what's been missing from the other biographies, or "Hagiographies," as he likes to call them. The book is pricey, which is why I borrowed it. The SR with Hertz Frankel standing left. Also seen are Yossel Ashkenazi and Sender Deitsch. Yosef718's point may have been lost on some of us. He wasn't trying to discourage women who don't cover their sheitlach from coming to daven at the tziyun in KJ. Chas Vesholem. 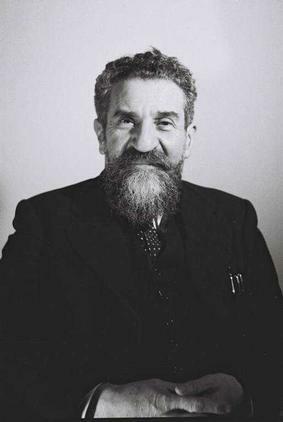 I think what he was trying to bring out is how the SR has been sterilized to be a lovable old zeide who only had nice things to say abut everybody and everything, and even his opposition to Zionism was in a nice way. I don't even think that Satmar itself has been leading this effort, it's mostly the Agudists and the Litwaukees. I'm not sure why this has been happening. 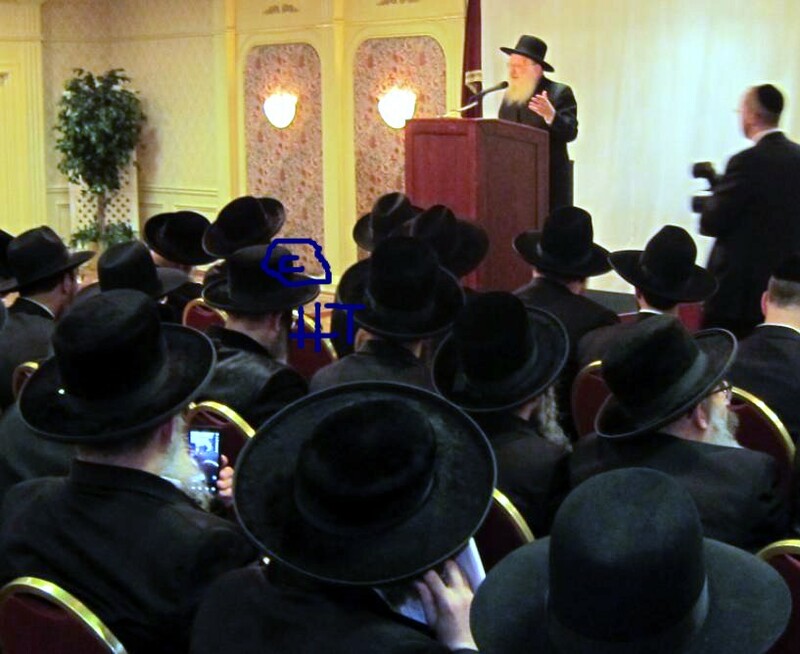 He's no Satmar Chossid himself, Yosef, I can vouch for that, so what they made of the SR is what bothers him. Which is why he brings up the points about his opposition to socks and so on, to show those who so love him that the love was not necessarily mutual. Not only did he not care for their socks, he also didn't care for the Mishna Berurah ! at times. Not only did he not care for their socks and Mishna Berurah at times, but he held they (in Israel) were all Ovdei A"Z by speaking Hebrew and teaching the language in their schools and having their schools funded by the heathen Israeli Gov't.! Yet every year they eulogize him in the Agudist literature as if he were one of their own, and in Ami magazine we're treated to a weekly ongoing series about him, despite the fact that claim to be very "open-minded." This is one life's great mysteries. 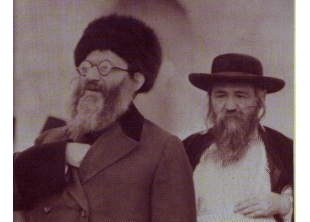 Which brings us to the concept of Chassidish Lite. I once heard that term from a man in a bungalow colony we once went to. (We worked there, we didn't go there on vacation.) He was speaking about a cheder that his son attended in Flatbush (Midwood) and said that he liked it because it was "Chassidish Lite." 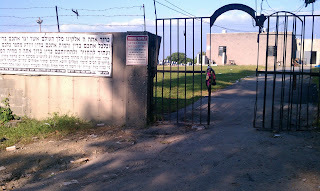 They teach in Yiddish but they don't give the kids or parents a hard time in other aspects... This man was a very proud descendant of Lubliner Chassidim and wanted his son to at least have an affinity to some things Chassidish, which he would not get if he went to a school like YOB or CB. 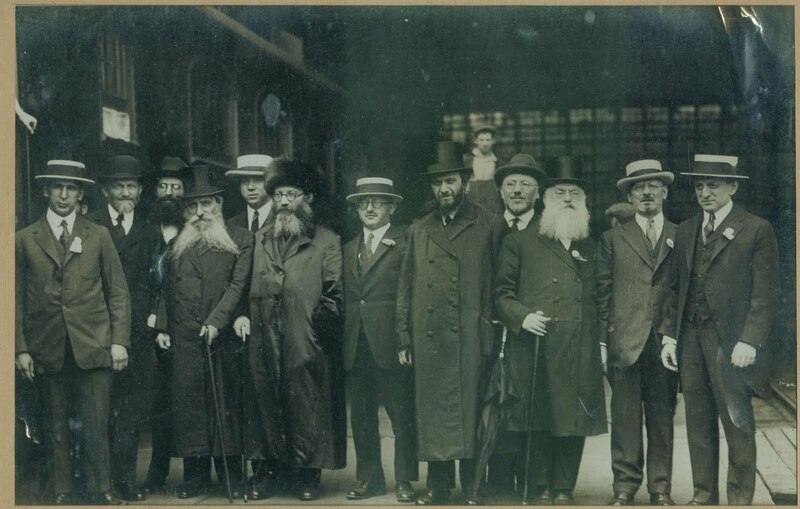 In many if not all Chassidishe Kreizen you see these Lite Chassidim. 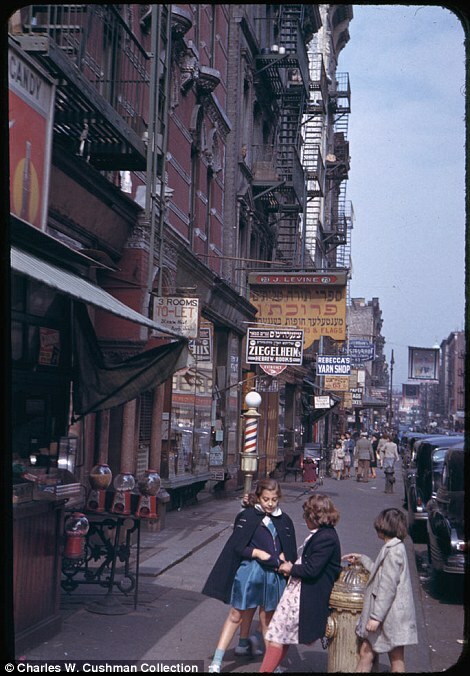 They come for a kvitel or to the simchas in the Rebbe's Hoyf, or they may even come for RH & YK, but they can't keep up with the regular vigor of everyday Chassidish life with its expectations and dress codes. Their parents and zeides were chassidim and they want to be as well. They send their kids to Litvishe Yeshivos probably because there they can have it all, am easier life and maybe become Lomdim too. They want it all. They're often men of means, so they get their due respect, despite the fact that they don't keep the takonos, etc. So, judging from the fact that the SR had "utter contempt," as Yosef718 so eloquently put it, for those who wore thin stockings, is there room in Satmar for the "Lite" crowd? He may not have minded that the men don't have the Chassidishe Levush, but he sure did mind when it came to the Ezras Noshim! My only question to Yosef718 is: was the Rov not Yotze Mrs. Hertz Frankel with Shofar either? or was she never there for the הייליגע טעג so as not to cause any trouble? 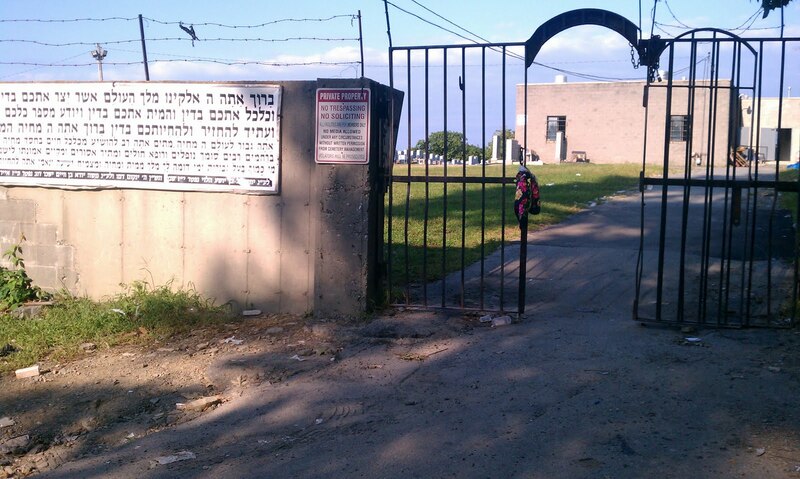 You probably came to the yortzeit of the Satmar Rebbe, whose Ohel is in the background of this picture. I don't know you, but I'll take a wild guess that only a lady who is not used to this kind of head gear would 'lose' it upon leaving such a place. I have seen your kind of peeps come from Queens, Flatbush and all over. I am sure that you are unaware that the Satmar Rebbe held your sheitel, your dress and your sheer stockings in utter contempt. You are also probably not aware that he held, Lehalacha, that if you heard your husband's kiddush in those thin stockings he and you were never yotzei. As a matter of fact every Rosh Hashonah he announced before the Aron HaKodesh that he is not motzei with Shofar those women not wearing thick stockings. So you came with your thin hose and a temp tichel to his grave to ask him to daven for you? Well, it's still there waiting for you, but I assume you're busy baking Challah with 40 other ladies, or you're busy filling out a form for The Vaad to give your name to Maran Rav Kanyevsky or Rav Eliyashov. Not to worry, those Satmars in their kindness will leave it there till next year, or the elements will claim it before you come by again. These are recently released photos of Harav Kook's (יא"צ ג' אלול) visit to the US and Canada in 1924. He was accompanied by the Kovner Rov, the Dvar Avrohom, Reb Avrohom DovBer Kahana Shapira, as well as Rav Moshe Mordche Epstein of Slabodka's Knesses Yisroel Yeshiva. 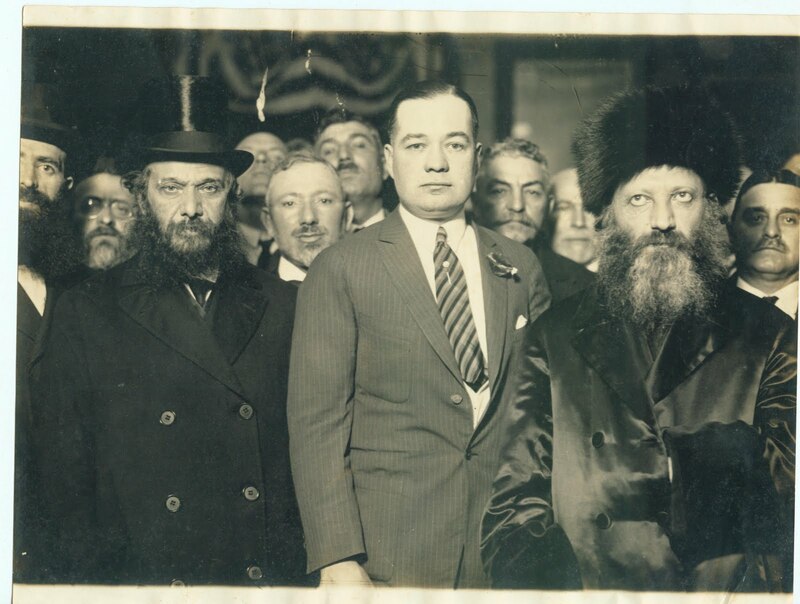 RAYHK was already back in the Holy Land since 1919 or so, yet he made the long journey to America to help the Yeshivos in Europe. It's ironic that many of those Yeshivos, including Slabodka, are quite unaware of the great help he was in saving their Yeshiva. I would imagine that none of his seforim and writings can be found in any of the many branches and satellites of Slabodka, both in Israel and abroad. Yet, despite the badmouthing and brainwashing that has been going for generations his writings have enjoyed a tremendous renaissance among many Haredim, who see him as a great visionary whose only crime may have been that he has slightly ahead of his time... His teachings are quoted, at least verbally - we have yet to reach the stage where he'd be quoted in a Haredi sefer - and if you repeat a vort from him you may not even get a "gasp!" from the man listening to you... Rav Kook's Chabad connection is well known; his mother was a Bas Chassidei Lubavitch, and many of his writings are based on Chassidus Chabad, as well as MaHaRaL. His adversaries also knew about it too, as mentioned here many years ago. 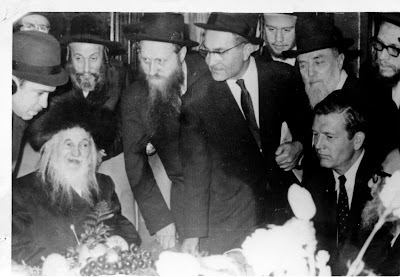 Despite the differences in opinion that he had with him and even the Agudah, the Frierdige Rebbe visited him - twice, I believe - when he visited Eretz Yisroel in 5689.
with RMM Epstein and an unknown figure of authority. Wiki says that it was the Mayor of NYC that he's pictured with. Yet, According to Wikipedia, John F. Hylan was mayor of NYC at that time, and this is not him. So either I'm confusing the dates of the trip or they got it wrong. click on photos to enlarge! On the porch of the Yeshiva D'Montreal with the Kovner Rov and RMME listening intently to RK's words. 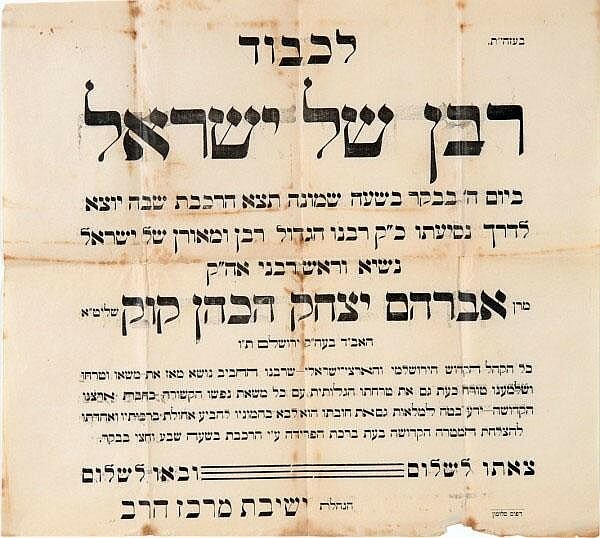 A "צאתכם לשלום" poster from his Yeshiva "Mercaz HaRav." with Rav Hirsh Pesach Frank, member of his Rabbinate and later Chief Rabbi of Yerushalayim. This picture is unrelated to the rest and was taken in the Holy Land.